Manchester United are actively working in the transfer window as a number of players are primed to be in and out of Old Trafford. United are keen to bridge the gap to Manchester City, who finished 19 points clear at the top of the pile last term and manager, Jose Mourinho is keen to shape the squad in his own image. A summer clearout is expected, with Marouane Fellaini the number 1 name out of Old Trafford. The curly-haired Belgian has failed to agree new terms with the club and has been linked to a move to Arsenal. His contract expires at the end of the month and will be a free agent come July 1. To incomings, Brazilian international. 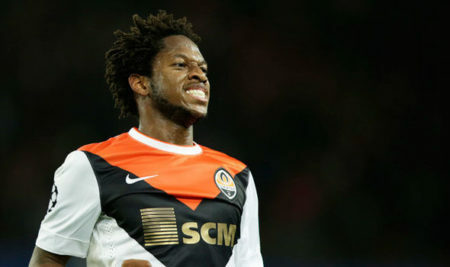 Fred is expected to complete his move to United later on this week. The 25-year-old is on the verge of a £52.5m move from Shakhtar Donetsk and was spotted at Carrington yesterday heading to the club training ground for his medical. He could also be handed the no 8 jersey currently worn by Juan Mata, who might take the vacant nunmber 10. He is expected to be handed the number 16 jersey vacated at the end of last season by club legend, Michael Carrick. He is expected to be United’s first arrival this summer and will slot into the midfield alongside Paul Pogba and Nemanja Matic. Portuguese teenager, Diogo Dalot is also expected to undergo his medical this week ahead of a move to The Theatre of Dreams. The 19-year-old right-back has a release clause of around £17.25m in his Porto contract, and is highly regarded by Jose Mourinho, who wants him to compete with Antonio Valencia for that number 2 slot. The pair of Daley Blind and Matteo Darmian are also close to exits from Old Trafford. Dutch defender, Daley Blind is wanted by Inter Milan while only minor details are holding up a deal for Matteo Darmian to Juventus.